Mario Moreno is a screenwriter, author, and creative coach with many years of experience. Screenwriting coaching for every level of your career. A member of the Writer's Guild of America, Mario often writes and provides commentary on the craft of screenwriting across several platforms, including the Screenwriter's Guidepost column for Script Magazine. 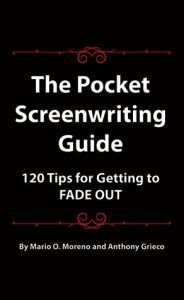 He also co-authored The Pocket Screenwriting Guide: 120 Tips for Getting to FADE OUT. Coach Mario Moreno provides customized guidance based on your own screenwriting goals, and can take you from first glimmer of an idea to a final draft, all while addressing your specific needs. Even professionals need an objective eye to review their material. Mario Moreno has the unique perspective of having worked within the studio system as a writer, but also as an instructor. Not only was my Story Specialist Mario Moreno a consummate professional but an invaluable source of critical feedback. He brought tremendous energy and insight to each of our weekly sessions. You would think he was earning a ten-percent manager's cut. Mario (expletive) rocks. You are a thought-provoking machine! As always, I would not have even progressed this far without the wonder that is Mario. I cannot say enough good things about him. He has patiently put up with a very green screenwriter and nurtured me into a semi-green writer. I learned more from him than all the screenwriting courses combined. Please pass this comment to whoever oversees Mario's work. Great feedback as always. Like taking a masters class in writing! I've had three really outstanding sessions with Mario. It is like the best lecture or high-level Q & A I've had since I started writing scripts. It would sell! It should be recorded. We are working simply off a "Save the Cat" outline. Just saying this is a class unto itself. Mario's Q & A! Dude, you need to seriously start charging more. I’m working hard on my script!! I have lots to go on with and really want to thank you for all your efforts on my behalf. I'm a serious fan of The Writers Store and yourself as mentor, and hope to have the opportunity to work with you again. Have to tell you that I woke up in the early hours of this morning rewriting scenes in my head, so I guess the script is not going to let go of me easily! Your notes from previous sessions on these scenes were invaluable on my latest draft. I've greatly enjoyed the experience, especially talking to Mario every week. I wish everyone involved the best of luck, and I know I'll take a lot from this experience and from my sessions with Mario. Like having a creative guru and all the bestselling writing books with you while you type, The Pocket Screenwriting Guide leads you through classic Hollywood storytelling with 120 succinct tips – mirroring the standard page length for a 2-hour film. The Pocket Screenwriting Guide also mixes in mythology and a breakdown of story into smaller, self-contained units of Acts, Sequences, and Pivotal Moments that serve the screenplay as a whole. It clarifies each step, with an "Also Known As" section, listing some of the more popular names given to that particular step by top storytelling experts. An invaluable resource for building an outline or treatment, The Pocket Screenwriting Guideassists you in writing the rough draft, and serves as a reference during the writing and rewriting process to help tighten and focus subsequent drafts. Never start a screenplay alone again. Keep The Pocket Screenwriting Guide close at hand every time you write a script. Take your writing to the next level with Mario's expert advice!